(AUSTIN) — The Senate Property Tax Committee held its first public hearing of the session to consider Senate Bill 2, the bill to cap local property tax growth absent voter approval. Houston Senator Paul Bettencourt, who chairs the committee, has filed similar legislation in the previous two sessions, but says this is the year that the state passes meaningful property tax reform. "We're going to solve this problem, " he said. "We're going to be here until we do." The headline provisions are a 2.5 percent cap on growth for all taxing entities and automatic ratification elections if an entity goes above that, but there are a number of provisions to increase transparency and improve training and qualifications for appraisal review board members. His bill would also exempt taxing entities that collect less than $15 million in combined property and sales taxes, which would stay at the current eight percent rollback rate. 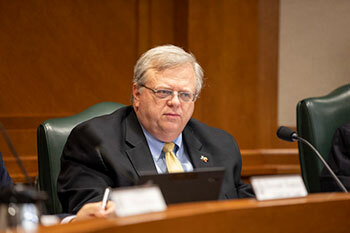 Houston Senator Paul Bettencourt is determined to pass property tax reform this session. His bill, SB 2, would make 2.5 percent the most a taxing entity can raise rates before triggering a ratification election. Bettencourt's argument is that property tax bills are increasing beyond peoples' ability to pay, pushing homeowners out of their neighborhoods and keeping young people from buying a house in the first place. He said that the first house that he bought with his wife cost $139,000 thirty years ago but today, that same property is worth nearly half a million dollars. Tax rates haven't come down since that time; he said they've gone up slightly. "I drove by my old home just over the weekend, and realized I'm not sure I could've afforded it," said Bettencourt. "I certainly couldn't have afforded it when it goes up three times the value and the tax rates actually increase." Bettencourt believes that as property values go up, tax rates should come down. While the state can't dictate property tax rates to local entities, it can attempt to slow growth by lowering the rollback rate, the rate at which a taxing entity must seek voter approval to surpass. Senator Kelly Hancock of North Richland Hills said at the beginning of the meeting that the term "rollback rate" is confusing to people who aren't experts in tax policy. He proposed calling it the "voter-approved tax rate" instead. Hancock also provided historical context for the bill, quoting Ray Farabee, the Senator from Wichita Falls in 1981 when the state approved the current eight percent rollback rate. Farabee said then that the rate was necessary to combat rising inflation and that when the inflation rate fell, the Legislature should revisit the issue. The rate of inflation did fall, from more than 10 percent in 1981 to 3.2 percent in 1983, but the state never readjusted the rate, said Hancock. He said it's time to rectify that. "What we are doing today, what we will do with this committee, is not only reasonable, it's past due and necessary for our constituents back home," said Hancock. Though local officials and legislators are often at odds on this issue, Bettencourt praised Travis Central Appraisal District officials for creating a real time tax database, a one-stop online clearinghouse for all tax rates, revenues, and other important information about tax policy for properties in Travis County. Bettencourt said that under current law, it's hard to find and decode all of this information, even for experts. "Right now the truth-in-taxation notices, even for people in the industry, are almost gobbledygook," he said. SB 2 would create a site like the Travis CAD's, but covering every taxing entity in the state. It would allow a homeowner to enter their address and receive a customized tax rate notice, including all relevant taxing jurisdictions, proposed tax rates, upcoming tax hearings, and how that will affect their tax bill. Once this bill passes the Property Tax Committee, it will head to the Senate floor for further consideration. The House will consider an identical piece of legislation, HB 2, in the Ways and Means Committee. If passed in both chambers, any changes made to either bill will have to be eventually reconciled before heading to the governor's desk. Starting from the same language in the House and Senate, however, likely increases the chances of agreement between chambers. The Senate will reconvene Thursday, February 7 at 2 p.m. for the reading and referral of bills.